MOVIE DAY UPDATE! Reservations are full for PaddleBR canoes and kayaks, but if you have your own canoe, kayak, paddleboard, pirogue, coracle, or whatever, feel free to crash the party. We’re planning to roll film at 7:30pm, and you’ll be able to see where to go. The University Lake Paddle-In Movie Theater only has one screen. UPDATE! With the LSU away game now an LSU home game with 2:30pm kickoff, things got a bit more “interesting”, but the Paddle-In Movie is GO for launch! We’ll have someone at the park extra early, and we’ll even hang out and wait if you’re stuck in traffic on the way to use one of our boats. Contact information provided in the email we’ll send when you sign up. It’s going to be great, and GEAUX TIGERS! Who? We’re having this Paddle-In Movie to say thanks to our PaddleBR members, whose support makes much of what we do possible. 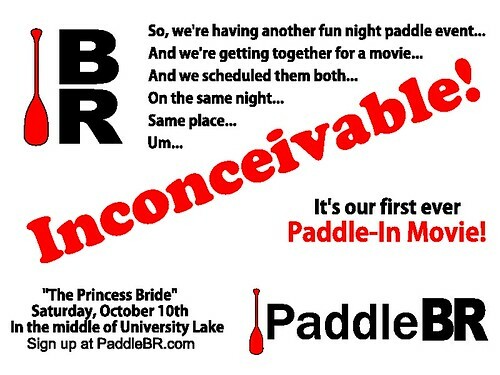 We encourage anyone who is not a PaddleBR member to consider supporting PaddleBR, but even if you don’t want to become a member right now it would be… inconceivable… to miss this event. Come out and enjoy one of our favorite movies, and perhaps think about a donation or membership (or sticker purchase) eventually. How? There is no charge or admission fee, but since there’s a bit more to having a Paddle-In Movie than our normal events, we’re asking that you please register in advance. If you don’t have your own boat, we also have a limited selection of canoes and kayaks available (boat requests are in the Paddle-In Movie registration form). After you register, we’ll send a confirmation email with complete details covering parking, launching, times, and so on. We’re looking forward to an amazing movie night out in the middle of University Lake. With fencing, fighting, torture, revenge, giants, monsters, chases, escapes, True Love, miracles…, it doesn’t sound too bad.